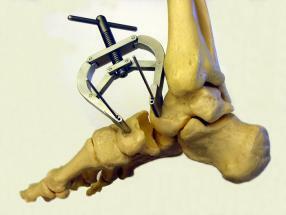 The Orthovation Tarsal Joint Distractor is the ideal surgical instrument for procedures such as arthrodesis, tarsal fractures, or coalition resections. The device provides up to 40mm of stable hands-free distraction of articular spaces and can also be used as temporary fixation to compress an osteotomy, fracture, or fusion site while placing internal fixation. As seen in The Journal of the American Podiatric Medical Association, APMA News, and Podiatry Management.